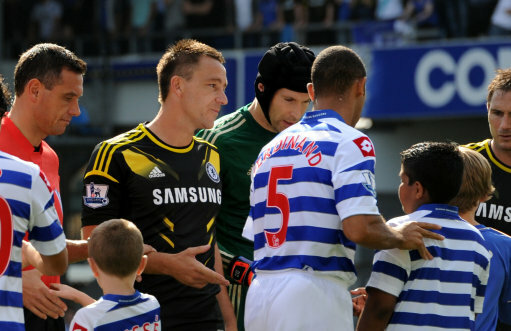 You may remember, not so very long ago, that John Terry was issued a four-match ban and stung for 220,000 of his barely-earned squidoodles by the FA after they found him guilty of using ‘abusive words in relation to colour or race’ toward Anton Ferdinand at Loftus Road last season. The FA’s independent panel have, this very morn, shown their working vis-a-vis Terry’s punishment – concluding, among other things, that Terry’s racist language towards Ferdinand was used as an insult and that there was ‘no credible basis’ for Terry’s “improbable, implausible and contrived” defence that he was only repeating words which he believed Ferdinand had first said to him. “The commission is quite satisfied, on the balance of probabilities, that there is no credible basis for Mr Terry’s defence that his use of the words “f**king black c**t” were directed at Ferdinand by way of forceful rejection and/or inquiry. “Instead, we are quite satisfied, and find on the balance of probabilities, that the offending words were said by way of insult. The commission said that character references from a number of people including black players made it clear that Terry was not racially prejudiced. The FA has also confirmed that the reason for Terry’s ban being half as long as the one handed to Luis Suarez (eight games) for an outwardly similar offence was due to Suarez’s persistent use of a racial slur toward Patrice Evra as oppose to Terry’s single-barrel gobshite-ery. The full reasoning over the FA’s verdict can be found here. accuse him of being a perjurer along with Cole by lying in court. When I read the words “improbable” “implausible” and “contrived”, I thought for a moment they were talking about the FA. Those three words pretty much sums up what the FA has been up to lately. “a racist”… I wonder what the sentence is in the UK for being found guilty of being “a racist”? Death, surely.